Much of the food industry has employed propaganda to increase their revenue dollars. The wine industry states that it is good for you due to the antioxidants contained within the grapes. This is true; however there are many, many other great sources of antioxidants that do the body just as good such as what's contained within organic: strawberries, raspberries, 100% dark chocolate, pineapple, etc. The dairy and meat industries do the exact same thing. They say their meat is lean so that makes it good. They say to eat and/or drink pasteurized, low fat dairy products because that is healthy. That cannot be further from the proven truth. First of all full-fat dairy is best due to the good fat that it provides. Secondly pasteurization is highly outdated. 150 years ago when pasteurization was discovered beneficial was due to the very unclean farming and dairy extraction practices. The milk would sit in pales that collected bacteria under various conditions. Louie Pasteur discovered by heating the milk to about 161 degrees Fahrenheit for about 15-20 seconds would kill most of the potentially harmful bacteria. It does this and it does this well; however in the process it also kills the good and friendly bacteria, vital other micronutrients such as enzymes and vitamins/minerals. 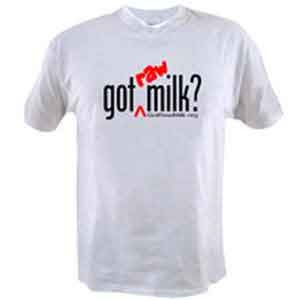 It is a fact that people are only “lactose intolerant” to pasteurized milk- not unpasteurized (aka raw) milk. That applies to most dairy allergies as well. This is due to all the digestive enzymes being intact. 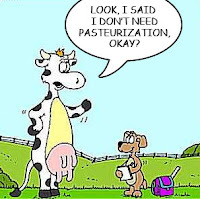 Pasteurization also destroys some of the milk protein as well as diminishes the amount of absorbable calcium to about 10%. This is why the dairy industry must synthetically saturate their milk with Vitamin D. This assists in the absorption of whatever calcium is left intact. If they simply left the milk in its raw state there would never be a need to do this. Modern dairy and farming practices are quite safe and very clean. Most dairies, whether producing raw or not, extract the milk from the cows in the exact same ways. The only difference is the pasteurizing of the milk or not. Another fact is that pasteurized milk is dead. That is why it rots, spoils, and becomes rancid. Raw milk never spoils. In fact if left out on the table for length it would simply curdle and turn into cheese. That is how cheese is made. A culture is added to milk and then it is left to age for a specific amount of time. Raw milk is one of the absolute healthiest drinks one can intake. The following was taken from the Mercola.com website. Naturally, the only milk available at the time was raw whole milk, rich in butterfat, from pasture fed cows. Dr. Crewe, MD -- one of the founders of the Mayo Foundation -- published an article in Certified Milk Magazine (January 1929), describing the milk treatment as a combination of “detoxifying fast and nutrient dense feeding,” and how diseases that have no similarity improved rapidly on raw milk. This despite the fact that striking results were seen in tuberculosis, diseases of the nervous system, cardiovascular and renal conditions. Anemia and pernicious anemia responded well to it, as well as toxic thyroid and chronic cough. Dr. Crewe, as a result of his experiences with food as medicine, became convinced that much of modern disease is due to an increasing departure from the simple preparation of plain nutrient-rich foods. Folks, when you look at the diets of indigenous cultures displaying robust health across the globe, regardless of whether their diet consists of mostly fruits, vegetables and dairy, or meats and fish, the common denominator is always that their diet is mainly eaten raw. Stray too far from a raw, naturally-grown diet and you’re bound to encounter health complications. And pasteurized milk is definitely FAR from its original, nutrient-dense state.